Akeni Web Chat for enterprise im lan 1.16 - Download Win Apps. 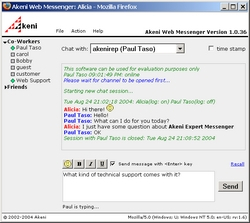 Akeni Web Chat for Enterprise IM. Akeni Web Chat for enterprise im is an instant system designed for universal accessibility and ease of deployment. It can be deployed solely in your business LAN (local area network) or can also be accessed using the internet. Web Chat can be installed with your existing Akeni Social Networking. It is also firewall friendly and can be used whenever you have access to a web browser. The rich client support chat, notification and conferencing.